If you're looking for a new kind of car-buying experience, why not try Conicelli Toyota of Conshohocken? We pride ourselves on being A Nice Place to Do Business, and our customer-friendly business practices ensure that you're always in control of the complete buying process. The extraordinary sales team at Conicelli Toyota of Conshohocken will never pressure or hassle you, because that's not the Conicelli way. The Conicelli family has earned great national recognition over the years. We've rated among the Top 10 dealerships in the country for Internet Sales for ten years now, according to Ward's e-Dealer magazine. We offer a complimentary annual Pennsylvania State Safety Inspection for all vehicles purchased at a Conicelli dealership, to ensure your safety on the road. We provide a free shuttle service within 10 miles of our dealership, so you can continue about your day with minimal disruption while your car is being serviced. We always make time for you with extended service and parts hours during the work week, from 7:30 a.m. until 7:30 p.m. And we're open on Saturday, too! We truly care about your convenience. We employ ASE-certified technicians to use modern, state-of-the-art equipment when maintaining or repairing your vehicle at our completely new Toyota service center. 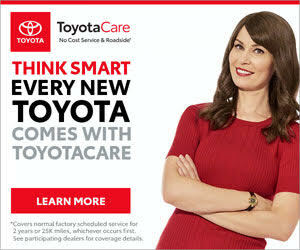 We offer discounted, extended service agreements to protect you when your Toyota needs extensive repairs. We make owning a car more affordable with trained finance professionals who will help re-establish your credit and offer you discounts on extended service agreements. Each of the extensive array of new and pre-owned vehicles on our lot comes ready-to-go with a full tank of gas. In thanks for your patronage, we also provide a 60-day or 3,000-mile limited warranty on any used car sold at all Conicelli dealerships. To ensure efficient service each time, we offer a Quick Service Lane for when you just need an oil or filter change or a quick lube job. If you choose to wait for your vehicle, please enjoy the amenities in our comfortable waiting room, including a work area, lounge area, big-screen TV, free Wi-Fi and a play area for children. The Blue Route, Schuylkill Expressway, PA Turnpike and other major highways all provide easy access to Conicelli Toyota of Conshohocken, conveniently located at 550 Ridge Pike.